This installment of the California labor history series is excerpted from the newly released book, From Mission to Microchip: A History of the California Labor Movement by California Federation of Teachers Communications Director Fred Glass. Available for purchase via the University of California Press website. In early San Francisco, workers faced serious problems every day. Workplaces were dangerous. Maimed workers with missing body parts were common sights on the streets. They labored long hours, in some industries ten-hour days, in others twelve or more. Work weeks typically lasted six and sometimes seven days. No laws protected worker health and safety, or made sure children went to school instead of a factory or the streets. Little was understood about the relationship between diseases and occupations. Workers were often left homeless and destitute when fires swept the city. 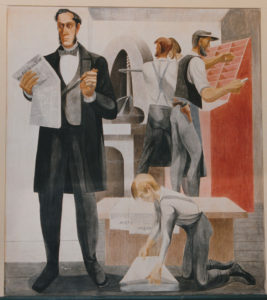 Printers, who formed the first union in California during the Gold Rush, typeset the California Star newspaper in artist Anton Refregier’s rendering. At least when it rained for a week, workers knew what to blame for their enforced idleness. But economic downturns idled workers for longer periods. Isolated by thousands of miles and months of travel from the rest of the country, the San Francisco economy wobbled greatly from one year to the next, vulnerable to chance: if a ship arrived a month late, merchants could be ruined and workers thrown out of work. For remedies to these problems, most workers relied on individual solutions: they scrambled from place to place, job to job. Injured, they patched themselves up. If they had a bit of savings, they could start a business. If all else failed, they might return to where they came from. Many looked for help at the bottoms of bottles. But for some San Francisco workers, individual solutions weren’t enough. Taking a broader view, groups of workers decided to improve matters through collective action. In November 1849, San Francisco carpenters earned $12 a day (in New York carpenters made less than $2) but still couldn’t keep up with enormously inflationary prices for food and rent in the rapidly growing city. When their employer refused to raise their pay to $16, a group of these workers declared the first recorded strike in California history. A week on strike brought a compromise: a dollar a day raise, from $12 to $13, to be followed by another dollar increase after three weeks. The following year, newspaper printers founded the first union local on the West Coast, the San Francisco Typographical Society. In August, wagon drivers in San Francisco established a political association and elected one of their members, James Grant, to a seat on the city council. In 1853, pressured by steadily growing numbers of workers’ organizations, the California State legislature passed the first progressive labor protective law, limiting legal hours of work to ten in a day. Historian Lucille Eaves, writing a half century later, puzzled over these actions: “There are evidences of such early trade-union activity in San Francisco that one is tempted to believe that the craftsmen met each other on the way to California and agreed to unite.” Alternatives to Eaves’ whimsical conspiracy theory are not hard to find. Scarcity of labor, a violent culture, and traditions of working class organizing carried from elsewhere by the immigrant population contributed to collective worker activities from the outset. Even with the steady influx of newcomers, labor power was one of the scarcest commodities, especially considering the amount of work to be done. San Francisco workers could make high wages because everything cost a lot of money. The price charged by labor was dictated by the comparison in everyone’s minds with the take of a gold miner in a day, and the willingness of workers to leave for the diggings. It was probably to the advantage of workers, on occasion, that the frontier society lacked effective legal structures. There was little centralized authority, and everyone was armed. Western labor relations took root within a broader violent culture. In the days before collective bargaining laws, spontaneous acts of collective violence could seem a useful path of action to workers without recourse to other means of solving problems. California workers benefited more, however, from political experiences imported by 49ers from the East Coast and other countries. The Irish brought traditions of anti-colonial organizing to America. German artisans carried their experience of craft organizations and socialist politics in their flight from the failed European revolutions of 1848. English workers came with Chartist ideas of republicanism. Such streams of political thought—along with currents of homegrown American revolutionary traditions—had fed the formation of unions and short-lived but influential workingmen’s parties in the Eastern states in the 1820s and 1830s. We might ask why printers built the first union in California. The answer is that members of this occupation were literate, had deep roots in guild traditions, and were already doing similar things around the country. The enthusiasm for public education in the early republic created a readership for printed materials of all kinds. The spread of literacy meant growing markets for the printed word, and jobs for printers. But the industrial revolution, urban competition, and advances in printing technology put steady pressure on the craft of printing. Fewer journeymen could become masters. Guilds broke up; masters joined employers groups, and journeymen formed unions. In May 1852, printers founded the first national labor organization, the National Typographical Union. The San Francisco Typographical Society reorganized itself in December 1854 as the Eureka Typographical Society, Number 21; it received the first local charter on the West Coast issued by a national union. Printers were soon joined in organizing by San Francisco workers of many occupations, including unions of sailors, musicians, cigar makers, dockworkers, painters, and others. From practically the beginning of the Gold Rush, collective actions by workers contradicted the common image that popularly represents mid-nineteenth century California: the lone miner, pan in hand, wresting a fortune in precious metal from the land through the sweat of his brow. He existed, briefly, but was never typical, and soon gone. James Marshall, the carpenter and millwright credited with discovering gold, died a penniless alcoholic. In the 1850s the first workers’ institutions begun to take root in the conditions faced by California workers in the frontier society. Due to the state’s volatile economy, and the strongly held belief in individual initiative shared by mid-nineteenth century workers, these early organizations were mostly ephemeral. Only the printers’ and longshoremen’s unions managed to last out the decade. Read more about the laborious hardships of early California in From Mission to Microchip: A History of the California Labor Movement, by Fred Glass, and published by the University of California Press you can pick up right here.